Product Title: - Real Women - Lucy for Genesis 3 female Author: Doctor Jo Product Date: April 2016 Product Copyright: 2010-2016 DrJo/MMC REQUIREMENTS -------------- Daz Studio 4.8 or later. DAZ 3D Genesis 3 female plus head and body morphs packages ################################################### All of the content in this package was created by doctorjo, using resources from various suppliers and skin texture references by 3DSK. ################################################### Installation Instructions Extract the zip-archive with your zip program to your Daz library folder, make certain 'extract all files' and 'use folder names' boxes are checked. 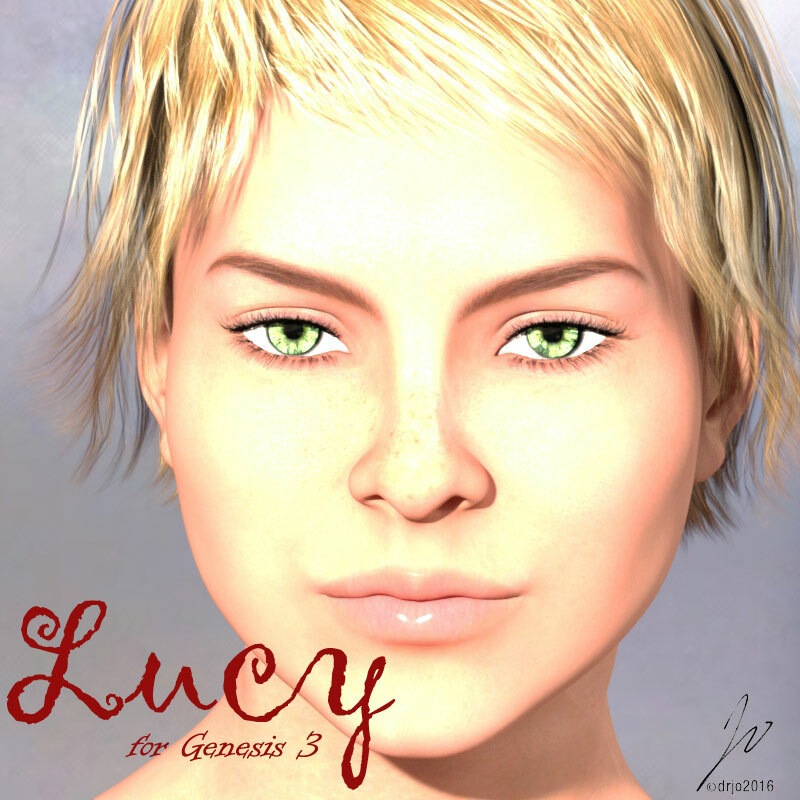 You will find Lucy in your Contents folder under People\Genesis 3 Female/Characters/drjo_lucy To load Lucy in one go double click on Lucy Complete (actor) or load the Genesis 3 Female base and apply the Lucy INJ file in Morph then select the Mat or Iray folders and apply the surface textures. File names & locations: \People\Genesis 3 female\Characters\drjo_LucyLucy complete.duf Lucy complete.duf.png \People\Genesis 3 female\Characters\drjo_Lucy\Morphlucy REM.duf lucy REM.duf.png lucy morph.duf lucy morph.duf.png \People\Genesis 3 female\Characters\drjo_Lucy\materials\Mats!Lucy mat.duf !Lucy mat.duf.png Lucy MU 1.duf Lucy MU 1.duf.png Lucy MU 2.duf Lucy MU 2.duf.png Lucy MU 3.duf Lucy MU 3.duf.png Lucy MU off.duf Lucy MU off.duf.png lucy eyes blue.duf lucy eyes blue.duf.png lucy eyes brown.duf lucy eyes brown.duf.png lucy eyes green.duf lucy eyes green.duf.png lucy eyes grey.duf lucy eyes grey.duf.png lucy eyes hazel.duf lucy eyes hazel.duf.png lucy nails F1.duf lucy nails F1.duf.png lucy nails F2.duf lucy nails F2.duf.png lucy nails F3.duf lucy nails F3.duf.png lucy nailsT1.duf lucy nailsT1.duf.png lucy nailsT2.duf lucy nailsT2.duf.png lucy nailsT3.duf lucy nailsT3.duf.png \People\Genesis 3 female\Characters\drjo_Lucy\materials\Iray MatslucyIray MU off.duf lucyIray MU off.duf.png lucyIray MU1.duf lucyIray MU1.duf.png lucyIray MU2.duf lucyIray MU2.duf.png lucyIray MU3.duf lucyIray MU3.duf.png lucyIray mat.duf lucyIray mat.duf.png \Runtime\Textures\drjo_LucyLucyArms-1.jpg LucyArmsB.jpg LucyArmsS.jpg LucyEye_blue.jpg LucyEye_brown.jpg LucyEye_green.jpg LucyEye_grey.jpg LucyEye_hazel.jpg LucyEyes.jpg LucyEyesB.jpg LucyEyesRef.jpg LucyEyesSurf.jpg LucyEyesSurfTr.jpg LucyEyesTR.jpg LucyFace-1.jpg LucyFace-2.jpg LucyFace-3.jpg LucyFace-4.jpg LucyFace-4.psd LucyFaceB.jpg LucyFaceS.jpg LucyLashes.jpg LucyLegs-1.jpg LucyLegsB.jpg LucyLegsS.jpg LucyMouth.jpg LucyMouthB.jpg LucyTorso-1.jpg LucyTorsoB.jpg LucyTorsoS.jpg LucyeyesDisp.jpg Lucygenetalia-1.jpg Lucynails-1.jpg Lucynails-2.jpg Lucynails-3.jpg -------------- Usage Tips/Limitations This product may not be sold or redistributed in any form, altered or otherwise, other than as part of an artistic render for commercial or non-commercial use. The elements can not be included (in whole or in part) in a CD Collection. ******************************************************************* Thanks for choosing Lucy I hope you and she have many happy hours together. Lucy is a shape and texture set for the DAZ 3D Genesis 3 Female model. A versatile robust figure full of charm. From the girl next door to the alien elf. A range of eye colors, make up and nail colors makes it easy to craft Lucy for any type of render. The materials files are optimised for use with Iray render engine, but work equally effectively with 3delight. The figure needs the Genesis 3 Female, Starter Essentials and both the body and head morphs packs. Promo 1 Toulouse hair by DAZ3D Promo 2 Portia Hair by April YSH Promo 3 Brooke Hair by Lady Littlefox Designs outfit Street Casual by DAZ3D Promo 4 Portia hair and Brooke Hair.